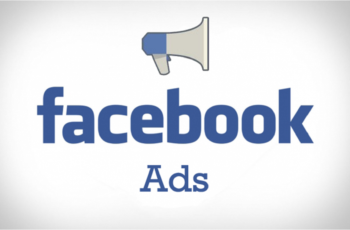 Facebook ads are a great way to increase your sales if you know how to do it right. Facebook has loads of data which can help you target and retarget your specific audiences easily. But again, the question is to how to do it right and how to measure the metrics? However, before measuring the metrics, there is one thing which you need to estimate and that is your earnings per click (EPC). Once you have your EPC calculated, you can easily analyze whether your ads are working well for you or not. In this article, we are going to discuss in detail the 11 proven ways to optimize your Facebook ads for your ecommerce store. The ways have been arranged in a step-by-step approach so that they are easy to implement for you. #1. Use the audience insights tool to target the right audience! 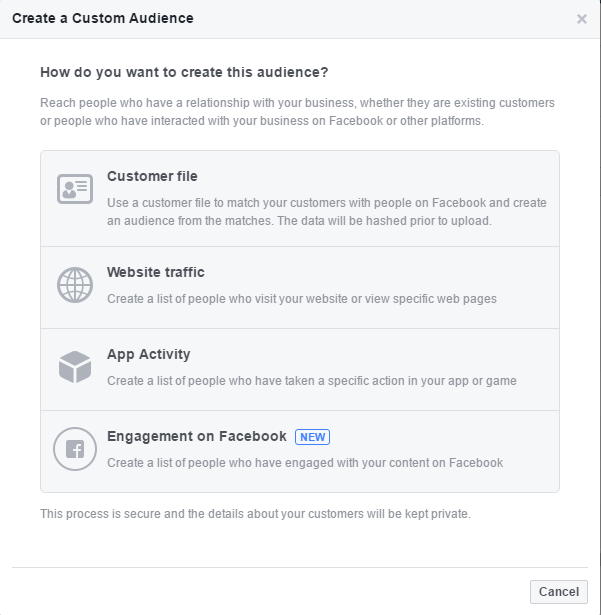 Facebook audience insights is an easy to use tool which helps you select the audiences and study their online behaviour pattern and also, their purchase behaviour. 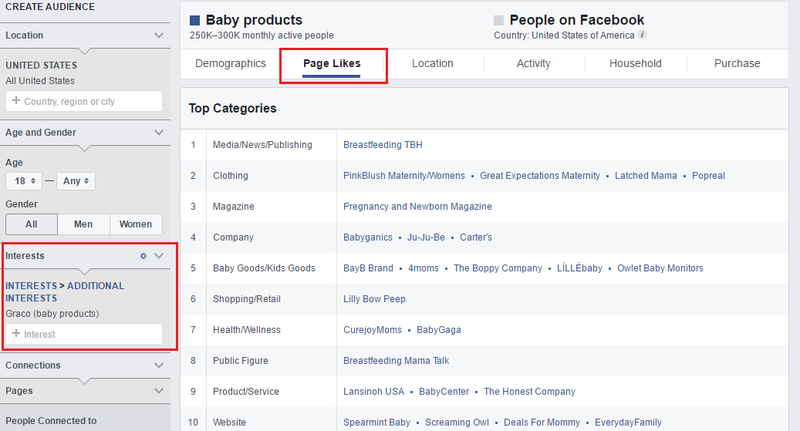 Let’s say you sell baby products on your store and want to find the right audience who would be interested in buying your products. So, you would go to the Interests section and enter baby products there. Select one of the suggested interests. (I have selected Graco(baby products) here for the example purpose). Then go to the Page Likes section and see the top categories of related pages. From these pages, select the pages with high affinity and note them down in an excel sheet. Once your sheet is ready, you can create the audiences using those interests and use it for targeting them. While creating your audience in ad manager, you can flex the audiences with each other to find a better-qualified audience. For example, you have selected five interests which are related to baby products; and you also want to target those who are parents. 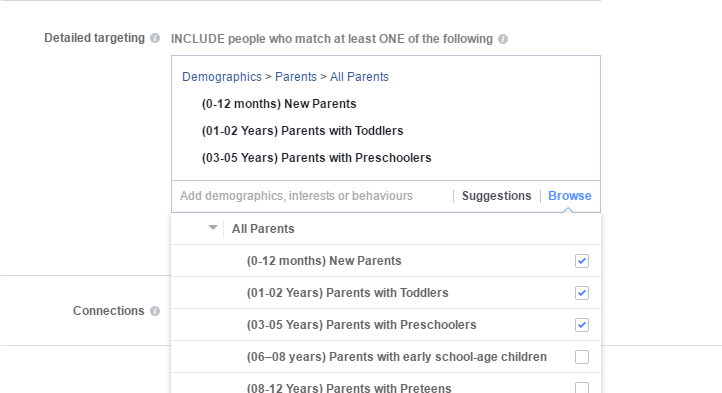 Then go to the Browse section and select Demographics>> Parents>> All Parents and check the parents who fall in your target group. After that, choose the narrow audience option and enter the interests you have selected based on affinity. 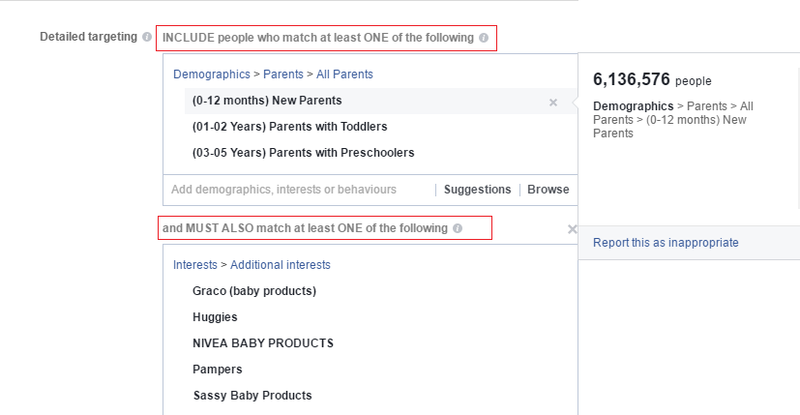 So, by using flex of these two audiences you are targeting the better qualified users who may buy the baby product. You can narrow audience further and even exclude audiences. In simple words, you can use the AND-OR-EXCLUSION logic to target your audiences. Creating custom audiences helps you target users more precisely. If you have an email database of clients who have purchased your products or have subscribed to your newsletter, then you can create a custom audience by uploading the CSV file of the email list. While you are running the ad, let the pixel optimize for at least 48-72 hours. Do not change the bid or the budget during this duration else it might interfere in the process of pixel optimization and your pixel may misbehave. This may lead to higher cost per action. Also, once you pause the ad and restart it after a while, give it at least 24 hours to re-optimize. Pixel plays a very crucial role in the whole ad optimization process. So, let it optimize and do its job. Do not reach to any conclusion about your ad with just one day of data. As of now, there are total 15 ad objectives from which you can choose your ad objective. If you want to engage more people then you can go for the Post Engagement ad type, if you want more clicks to be generated then you can go for ‘website conversion’ ad objective and select the ‘optimize for clicks’ as the pixel fire event. If you want products to be added in the cart then you can choose the ‘add to basket’ event in the ‘website conversion’ ad objective. Tip: If you want to run a campaign for selling your product, run a website conversion ad with either Add to Basket or Purchase event. For your ads, ensure that the image is attractive and can grab the attention of your audiences. If you are promoting any product in your ad then try to use an image of 1200*1200 pixel size and highlight the product smartly. For link ads, you may use the image of size 1200*628 pixel. Also, for the same ad copy and the audience, split test different images for checking which one performs better. Earning organic traffic can help you get more traffic on your website. The best way to do that is to make your audiences share the ad with their network. Hence, it is suggested to promote the content/video/links which people would want to share with their network. This also helps with the relevancy score of your ad. Keeping other things same, create at least two ads with different ad copies to check the performance. Whichever is successful, continue with that ad copy. It is estimated that by 2018, 79% of the traffic on the internet will come through videos. Video view ads are a great way to engage your users on facebook. Also, they will cost much lesser than the usual ads. The metric which should be measured while analyzing the results of the video ads is 75% video views. The people who see your ad till 75% of the video length are the ones who might be actually interested in your product, service or content. #11. Mobile or desktop or both? Which device should you choose? While running an ad, choosing the correct device is also very important. If you are running an ad for the first time and not sure which device is used the most by your user, then run the ad on ‘All the recommended devices’. Track the conversions and after three to four days see which device is performing better in terms of the ad objective chosen by you. If your ad objective is PPE (page post engagement) then check from which device (mobile or desktop) majority of the engagement is coming. If your ad engagement is coming only from mobile then duplicate the ad and change the device to mobile. Use the same process for the desktop device. If engagement on both the devices is good, you can keep the same ad and analyze results for more days. Select the device which can get you maximum results. Keep on testing till the time you find optimum results for your ad campaigns.